This past winter, we know many of you have experienced your fair share of snow and cold. If the voice in your ear is telling you to get to The Reefs but you can't get away for a week, we have the perfect solution. Our Bermuda 'Shorts' package will help you escape and indulge in everything The Reefs Resort & Club has to offer. Our three- or four-night 'Short' packages give you the "R and R" you need to leave you feeling a different kind of "R and R" - refreshed and revived. In addition to accommodations, our Bermuda 'Shorts' package includes a $100 credit per person for a golf outing or a La Serena Spa treatment and daily breakfast at Ocean Echo restaurant, overlooking the beautiful Bermuda beaches. Our 'Shorts' also include a lunch at Coconuts on the beach or a picnic basket lunch to go, plus one dinner at Coconuts, Ocean Echo or Royston's. 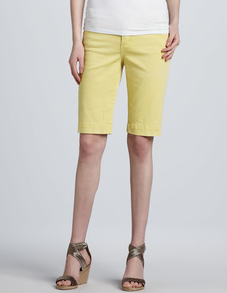 Need Bermuda shorts to go with the 'Short' getaway you just booked? Not to worry - we've got you covered! Men, our top pick comes from Vineyard Vines. 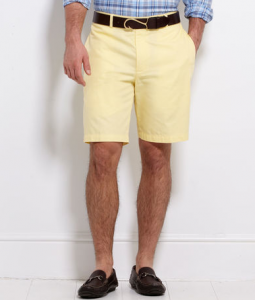 Available in twelve colors, these Summer Club Shorts are perfect for your Bermuda escape. Ladies, this season, we're loving Christopher Blue's twill Bermuda shorts. Casual, comfortable and fashionable, these twill shorts are great for taking a stroll on the beach or grabbing a bite to eat at Coconuts. Now that you've read about our Bermuda 'Shorts' package and even seen our favorite shorts of the season - now it's time to book your trip! Visit our new website at www.thereefs.com/spa for more details on The Reefs and our Bermuda 'Shorts' getaways.